Thanks to Larry Ferlazzo this morning learned about a new program that will provide Title I schools with access to thousands of free ebooks. Open eBooks is a program organized by the White House's ConnectED initiative. Through the program Title 1 schools as well as libraries, preschools, and community programs serving populations that have 70% or more students in need can access thousands of free ebooks on iOS or Android devices. The ebooks in the Open eBooks collection come from the following publishing partners Bloomsbury, Candlewick, Cricket Media, Hachette, HarperCollins, Lee & Low, Macmillan, National Geographic Kids, Penguin Random House, Simon & Schuster. Through the Open eBooks app students can access up to ten books at a time. To register for the Open eBooks program, click here. 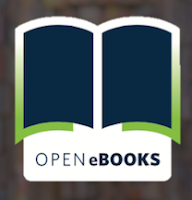 You can find all of the qualifications for the Open eBooks program here.